www.searchingforreason.net : NPR NEWS- Michael Cohen Admits Trump Tower-Moscow Talks Continued Well Into 2016 Campaign. NPR NEWS- Michael Cohen Admits Trump Tower-Moscow Talks Continued Well Into 2016 Campaign. Michael Cohen walks out of federal court on Thursday in New York. Cohen admitted he lied to Congress about Donald Trump's real estate negotiations in Moscow. 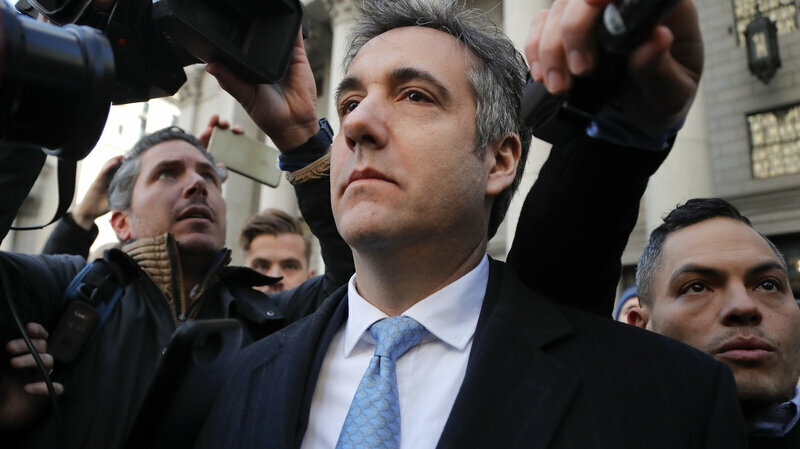 Donald Trump and his aides continued negotiations about a potential Trump Tower project in Moscow well into the 2016 presidential campaign, his ex-lawyer Michael Cohen acknowledged in a guilty plea in a New York federal court on Thursday. Cohen admitted that he lied to Congress last year when he said that those discussions had ended in January 2016 and that his overtures to the Russian government went unrequited. In fact, the talks continued through June, and Cohen did hear back from one of Russian President Vladimir Putin's top aides, spokesman Dmitry Peskov, according to court documents. Trump told reporters at the White House on Thursday that Cohen is lying. But that even if Cohen weren't lying, the president said, he hadn't broken any law. "There would be nothing wrong if I did do it," he said. Trump said his pledge not to conclude new deals only applied after he had been elected and inaugurated. He was perfectly within his rights to continue to run his businesses even as he pursued the presidency, he said. Trump said he ultimately decided not to pursue a real estate project in Russia, but it isn't clear precisely how discussions ended over the notional Trump Tower in Moscow. In a statement provided to NPR Thursday afternoon, the president's lawyer didn't pull any punches when it came to Cohen. "Michael Cohen is a liar," said Trump lawyer Rudy Giuliani. "It's no surprise that Cohen lied to Congress. He's a proven liar who is doing everything he can to get out of a long-term prison sentence for serious crimes ... that had nothing to do with the Trump Organization." "With regard to the hotel proposal in Moscow," Giuliani also said, "the President has been completely open and transparent." The new timeline established by Cohen's plea means that the talks with Russians and the Russian government were ongoing when Trump became the GOP front-runner and not long before he formally became the party's nominee. People described in the court papers, including Cohen, even discussed when to schedule potential trips to Russia as part of their negotiations as they planned for the Republican National Convention in Cleveland. The GOP adopted a platform at that convention that softened the party's official view on support for Ukraine, which Russia had invaded in 2014. It isn't clear whether there's any link among Russians, American political figures and that change in the platform, although such a connection has long been a subject of speculation. Cohen's acknowledgement on Thursday also means that the negotiations with Russians were taking place the same month as the much-discussed meeting in New York City at which the president's top campaign aides hosted a Russian delegation that had offered dirt on Hillary Clinton. Trump and his son Donald Trump Jr. have admitted that campaign leaders went into the meeting expecting material that would be useful against the Democratic presidential nominee but said that this is common practice in politics and that nothing came from it. According to accounts from people in the meeting that were given to Congress and from elsewhere, the Russians provided a tip about people who they said were improperly funneling money to the Democratic National Committee. Trump Jr. has said he did not take any action based on that tip. The question about what Trump knew specifically about that meeting and generally about Russia's wave of active measures against the U.S. is at the heart of the investigation being run by Justice Department special counsel Robert Mueller. Mueller is trying to determine whether anyone on Trump's campaign conspired with the Russians who interfered with the election using cyberattacks, the dumping of stolen data, agitation on social media and other techniques. 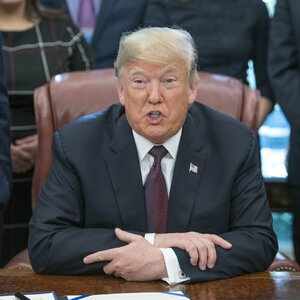 Trump has denied publicly that he had any knowledge at the time and said as much in written answers recently given to Mueller's office, according to reports on Wednesday. 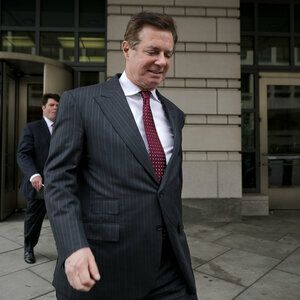 Trump's opponents faulted what they called the deepening air of criminality around the president's sometime-associates, several of whom have pleaded guilty in the Russia case or associated investigations. "This is yet another example of the President's closest allies lying about their contacts with Russia. With each indictment and each guilty plea, we learn more about the president's connections to Russia in the midst of Russia's efforts to interfere in the 2016 election," said Virginia Sen. Mark Warner, the top Democrat on the Senate intelligence committee. Warner's committee was one of the two to which Cohen gave statements that his guilty plea now admits were lies. Warner and other Democrats say the prospect of increasing pressure from Mueller's office means the Senate must pass legislation that would protect him from being pressured or fired by the president. "Special counsel Mueller's investigation must continue — free from political interference by the president — until the truth is out, and Congress should pass legislation immediately to make sure that happens," Warner said. The other committee to which Cohen has now admitted lying was the House intelligence panel; its incoming chairman, California Rep. Adam Schiff, said on Thursday that the plea shows how important it will be to launch new investigations in 2019. "These false statements regarding the continued pursuit of a Moscow-Trump Tower deal during much of the presidential campaign only underscore the importance of a thorough investigation into any financial entanglement between Trump and Russia," he said.